On August 9, The Seattle Times published a story titled “‘I couldn’t give up:’ Grueling hike for man on a mission,” about vegan hiker Josh Garrett, a 30-year-old fitness coach from Santa Monica, Calif., who broke the speed record for hiking the Pacific Crest Trail. Josh hiked with sponsorship (and PR help) from Whole Foods CEO John Mackey, and did it to raise awareness about factory farming and show that a vegan diet can be nutritious enough to power a 2,650-mile walk from Mexico to Canada – in 59 days, no less. The media loved Garrett’s story, and papers across the country proclaimed him the fastest person to ever hike the PCT. And indeed, Garrett broke the record for the fastest supported PCT hike, meaning he had a team that supplied him with food and gear, which lightened his load and reduced his need to stop in towns along the way. But most papers didn't mention another thru-hiker who reached the Canadian border a day before Garrett. Heather Anderson, 32, arrived in the dark around midnight on Aug. 7, exhausted and alone. And she set two even more impressive records, becoming the fastest woman to hike the PCT (in 60 days), and the fastest self-supported hiker – male or female – breaking a 2011 record by nearly four days. By doing a self-supported expedition, Anderson tacked on an additional 30 miles by walking into towns to pick up her resupplies. She also planned her own logistics, food and gear. Anderson, who is from Bellingham, Wash., and goes by Anish on the trail, doesn’t seem at all bitter about the attention lavished on Garrett. The girl simply loves to hike. “I don’t have anybody promoting me,” she said. 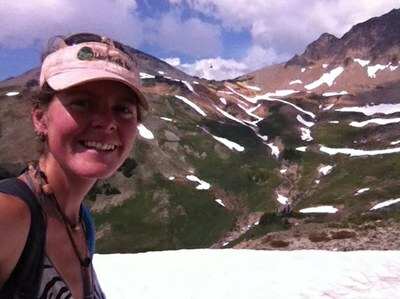 “I don’t go and seek that out.” I recently talked with her about her two months on the PCT. Anish on the trail. Courtesy Heather Anderson. High Country News: Welcome back to civilization! What are some of the things you looked forward to most in getting off the trail? Heather Anderson: Sleep. That and hot coffee and good food. When I was on the trail I ate while I walked. Clif bars and cookies and chips and Ritz crackers and dried fruit were probably 98 percent of my diet, so it was nice to come back to a world where food is cooked. HCN: What motivated you to try to set a speed record? HA: I first thru-hiked the PCT in 2005, and it’s one of those funny things you think about while you’re out there. I saw people attempting speed records and wondered how fast I’d be. I like the idea of seeing how far I can push my body. (I had) a lot of fears and weaknesses that I wanted to address, and there had never been a woman that had done a self-supported attempt of this length. HCN: What was your hiking experience before this? HA: Growing up in the Midwest, my family didn’t put a huge emphasis on exercise. It wasn’t until I was in college and hiked in the Grand Canyon that I was like, ‘wow, you can go really cool places just by walking.’ It appealed to my sense of adventure. But my first few hikes were very, very hard. I’d never done anything active in my life. Right after I graduated college (in 2003) I thru-hiked the Appalachian Trail, and that cemented my dedication to long-distance hiking. I (also) thru-hiked the Continental Divide Trail in 2006. HCN: What really challenging moments did you have on the trail? HA: There were a lot of times when I questioned what I was doing and whether I was going to make it. I remember lying there at night trying to sleep and my legs and feet were aching and spasming. The only sleep I got in the first ten days was because I was so exhausted I passed out, and then the pain would wake me up again. HCN: How many miles a day were you hiking? HA: Between 40 and 50 miles every day. I hiked a lot in the dark. That was one of the challenges that I knew I wanted to overcome. I was scared of mountain lions, and I’ve always been terrified of being out at night. In the past, if it was starting to get dark and I hadn’t found a place to camp, I’d literally be running down the trail almost crying. So on this trip I made myself hike three or four hours each night. I saw four mountain lions. HCN: Do you have a favorite piece of gear? HA: My tent; I absolutely love it. I have a ZPacks Hexamid tent — basically cuben fiber and bugnetting. I don’t like bugs and things crawling on me so I sleep in my tent every night, and especially when you’re on this long expedition, there’s something super comforting about that. You crawl in and you’re home. HCN: Having done several thru-hikes before, what was different this time? HA: Forming a community with other hikers was something I missed a lot. Also, I’ve always taken at least a day or two off to rest, and there was none of that. It was relentless. And because I was attempting to break the self-supported record that Scott Williamson set, I wanted to do it the way he’d done it: when you get your resupplies in town, you don’t hitchhike. You walk. HCN: Were you timing yourself? HA: Yeah, it’s the honor system. I carried a SPOT beacon and used that for independent verification. But when I got to the Canadian border it was almost midnight and there was no one there. I was so tired and emotional and I was trying to figure out how long it had taken me so I could write it (on the trail register) and I counted wrong and wrote 61 days. When I posted on Facebook, five people sent me a message saying I counted wrong. Other people were tracking it more closely than I was. HCN: So that’s what it was like in the end? Nobody was waiting for you? HA: My boyfriend and a good friend were on the Canadian side camped about a quarter mile away. There was some miscommunication and I thought they were going to be at the border, so I had no idea where they were. I was like, um, this is kind of a big deal! I wanted people there cheering, but they were sleeping. My friend’s dog heard me and started barking and they got up and we sat and talked a little bit. The next morning, we got in the car and drove home and it was like it had never happened. It was so surreal. I took a shower and ate the food I wanted to eat and that was it. Krista Langlois is an editorial intern at High Country News. Clarification: This story has been changed to reflect that Josh Garrett hiked with sponsorship from Whole Foods CEO John Mackey, not the company itself.